1979. Discover New Mexico. Travel guide. Albuquerque: Sunbelt Press. 1979. The Mute Strategy. Novel. Albuquerque: Sunbelt Press. 1984. The Fiery Cuisines. Cookbook. New York: St. Martin’s Press. Berkeley, CA: Ten Speed Press, 1991. With Nancy Gerlach. 1986. Fiery Appetizers. Cookbook. New York: St. Martin’s Press. Albuquerque: Border Books, 1991. With Nancy Gerlach. Monthly Press. New edition, Gulf Publishing, 1993. Little, Brown & Co. With Nancy Gerlach. 1991. Hot Spots. Cookbook. Rocklin, CA: Prima Publishing. 1992. The Food Lover’s Handbook to the Southwest. Travel and cookbook. 1992. Just North of the Border. Cookbook. Rocklin, CA: Prima Publishing. 1993. The Pepper Garden. Gardening guide. Berkeley, CA: Ten Speed Press. 1994. Hot & Spicy & Meatless. Cookbook. Rocklin, CA: Prima Publishing. With Mary Jane Wilan and Melissa T. Stock. Mary Jane Wilan and Melissa T. Stock. 1995. Hot & Spicy Latin Dishes. Cookbook. Rocklin, CA: Prima Publishing. 1995. The Habanero Cookbook. Cookbook. Berkeley, CA: Ten Speed Press. The Crossing Press. With Mary Jane Wilan. Publishing. With Mary Jane Wilan and Melissa T. Stock. CA: The Crossing Press. With Nancy Gerlach. 1996. Hot & Spicy Caribbean. Cookbook. Rocklin, CA: Prima Publishing. Speed Press. With Paul Bosland. 1997. Hot & Spicy & Meatless 2. Cookbook. Rocklin, CA: Prima Publishing. Celestial Arts. With Nancy Gerlach. Celestial Arts. With Chuck Evans. 1998. The Flavors of Africa. Cookbook. Rocklin, CA: Prima Publishing. 1999. The Healing Power of Peppers. Health book. New York: Three Rivers Press. With Melissa T. Stock and Kellye Hunter. 1999. The Chile Pepper Encyclopedia. Reference. New York: William Morrow & Co.
2001. Barbecue Inferno. Cookbook. Ten Speed Press. With Nancy Gerlach. 2001. Too Many Chilies! Growing, Using and Preserving Peppers. Detailed preserving techniques and recipes. Golden West Publishers. With Nancy Gerlach and Jeff Gerlach. 2005. The Spicy Food Lover’s Bible. The ultimate guide to key ingredients that give food spice. Food history/cookbook. Stewart, Tabori & Chang. With Nancy Gerlach. 2006. Da Vinci’s Kitchen: A Secret History of Italian Cuisine. Food history. Ben Bella Books. Also published in 14 other countries. 2007. Avenging Victorio: A Novel of the Apache Insurgency in New Mexico, 1881. Rio Grande Books. 2009. The Complete Chile Pepper Book. Identifying, gardening, preserving, and cooking with chile peppers. With Paul Bosland. Timber Press. 2010. Founding Foodies: How Washington, Jefferson, and Franklin Revolutionized American Cuisine. Food history. Sourcebooks. 2010. 1001 Best Hot & Spicy Recipes. Cookbook. Surrey Books. 2011. The Southwest Table. Food history and cookbook. Lyons Press. 2013. 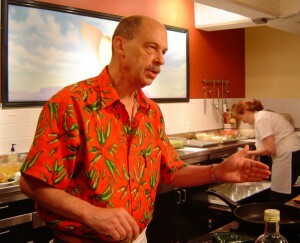 The Pepper Pantry: New Mexico Chiles. Cookbook. Terra Nova Books. 2013. The Pepper Pantry: Jalapeños. Cookbook. Terra Nova Books. 2013. The Pepper Pantry: Ancho and Poblano Chiles. Cookbook. Terra Nova Books. 2013. The Pepper Pantry: Sweet Heat. Cookbook. Terra Nova Books. 2013. The Pepper Pantry: The Essential Chile Sauce Guide. Cookbook. Terra Nova Books. 2013. The Pepper Pantry: The Essential Hot Spice Guide. Cookbook. Terra Nova Books. 2014: Dishing Up New Mexico. Cookbook. Storey Publishing. 2014. Precious Cargo: How Foods from the Americas Changed the World. Food history. Counterpoint Press. 2015. Microfarming for Profit: From Garden to Glory. Business book. Torrey House Press. 2016. The Field Guide to Chiles. Field guide. With Janie Lamson. Timber Press.